Graduation tableware can be planned by theme or color. Purchase as kits or individual pieces. Many graduation tableware come in kits of various sizes and options. Create a trendy open house party display with our Grad Chalk 2018 Party Pack.? The black background on the plates resembles a chalkboard featuring a grad cap and the words 2018 GRAD on the dinner plates and cups and CONGRATULATIONS GRAD on the dessert plates. This party pack contains service for fifty guests. 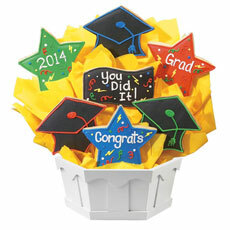 Sweeten their graduation with a hand-decorated cookie bouquet to say 'congrats, you did it.' This item is priced as a 7 cookie. Give their spirits a boost! 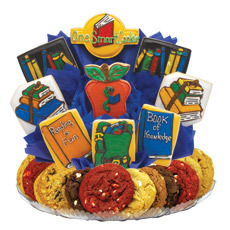 Send your smart cookies back to class with this delicious, hand decorated cookie bouquet. - This item is priced as a 9 cookie.